Welcome and congratulations on your pregnancy! 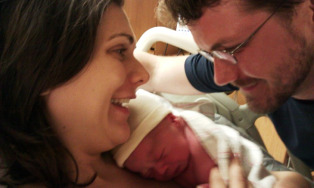 I am so glad you've decided to look into the Bradley Method® for your upcoming birth. I teach my classes in Beverly, MA, and look forward to teaching you and welcoming you to my class. At the heart of The Bradley Method® is preparation and education--to give you and your partner the tools necessary to make your upcoming birth experience a good one (regardless of whether it satisfies all your hopes, or if it takes a different path). Bradley teaches you to "tune in" to yourself and to work with your body and your partner, instead of simply relying on distraction techniques or medication. Why be distracted from what many people discover is a wonderful, life-changing, and empowering experience? Our society often focuses only on the pain of birth, without realizing that there is ample space in the experience for love, joy, transcendence, power, and togetherness to be present in order to truly honor a woman in labor. Topics include labor and what to expect, nutrition for mama and baby, exercises that condition and tone your body in preparation for birth, relaxation and massage for pain management, informed consumer choices, and positive communication with birthing staff. (Plus, the why behind these topics.) We will also focus on training your partner as your birth coach and advocate---an educated and prepared partner creates a more rewarding experience for the entire family. And, since birth is just the beginning (not the finish line) it's important to me to help couples face the challenges that the first weeks (months? years?) may bring, and to find a successful path to parenthood. In classes we will watch videos, discuss birth topics using the student workbook, play some games, practice positions, and hold labor rehearsals. Ideally, it’s best to start your series during the second trimester. ***Now registering for my summer series, held May 21-Aug 6, 7-9pm, or July 2nd-Sep 17th, 7-9pm. *** Cost is $350 per couple. Please email me at Susanna@birthingwise.com for more info. Note: If the day or times of classes don't work for you, please contact me. We may be able to work something out.